Out-GridView provides a better way for PowerShell to present tabulated information. 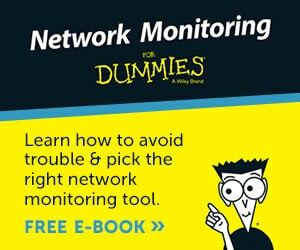 It works particularly well for displaying data returned by Get-Service or Get-Process. If you have not seen Out-GridView before it could be because this is a new cmdlet in PowerShell Version 2.0. As with any new cmdlet, before we put Out-GridView to work it’s worth calling for help so that we can check the syntax and seek out interesting parameters. Note 1: Because I want to see examples, I rarely use Get-Help without appending the -full switch. In this case help alerted me to sorting the columns by simply double-clicking their heading. In addition, it was only by reading the help file that I realized the benefit of using the ‘Search’ box as a filter. Note 2: The only problem I have encountered with Out-GridView is spelling the noun. Grid View is wrong, and omitting View is another fatal sin, Out-Grid does not work. Remember it’s one word, gridview as in Out-GridView. Note 1: Please remember the pipe (|), especially when you get too ambitious, and something goes wrong with your complex experiment. Note 2: You can also copy the data displayed by Out-GridView and paste it into Excel. Numeric data often benefits from further manipulation by the spreadsheets functions. I find that the old keyboard shortcuts such as Ctrl + a are handy for selecting all the rows. 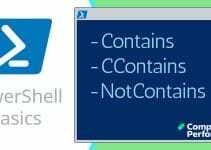 This example illustrates the benefits of adding extra PowerShell code in order to control the headings. For example, we want the name of each process in the first column. Note 1: Remember that you can sort on any of the columns simply by double-clicking. Note 2: It surprised me to discover that you can also drag and drop the columns to re-order the data. Resizing the columns works intuitively, just like Excel. Note 3: Out-GridView has a search box that you don’t normally get with Get-Process. One use of this Search capability is to filter the data. Another surprising feature of Out-GridView is how we can group items. 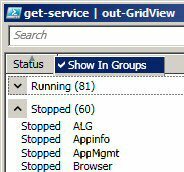 For example, with Get-Service you can aggregate the services that are stopped. Just right-click on the heading and see if it supports ‘Show in Groups’. See screenshot to the right. All in all, Out-Grid means that you can manipulate data quickly on the fly, this saves having to revisit the code and changing the properties or adjusting the grouping syntax. Note 1: I don’t want you to go away thinking that Out-GridView is only suitable for Get-Service, it’s just that all Windows computers have services, and their data shows off this display cmdlet in it’s best light. 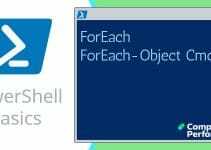 Footnote: In PowerShell 3.0 Out-GridView supports the -PassThru parameter. 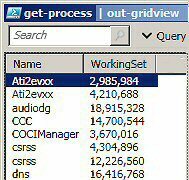 While Out-GridView is easy to understand, it maybe that you already know other members of the ‘Output’ family of cmdlets. My point is that if you have already used Out-File then you will know what to expect from Out-GridView. On the other hand, if this is all new territory, then you can apply knowledge of Out-GridView to Out-Printer. PowerShell v 2.0 has a lovely new cmdlet called Out-GridView, what this does is take the output from another command and present it in a new window where the data is displayed in an interactive table. Take the time to research the ‘Search’ box and discover how to ‘Show in Groups’.